This presentation will provide a solid platform of the anatomy and physiology of the retina and optic nerve at it relates to the ophthalmic imager. Case presentations and diagrams will be used to establish specific landmarks for the imager to utilize. The student’s understanding of anatomy and physiology of the eye is crucial for successful ophthalmic imaging. Terms such as retina, choroid, neurosensory retina, lamina cribosa, neural rim, etc will be discussed in length. 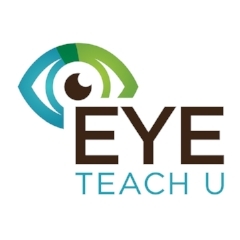 Upon completion of this course the imager should have an improved understanding of the specific anatomy of the retina and ONH involved in all forms of ophthalmic imaging. Students should be able to properly name the major anatomical landmarks of the inner eye and their physiological function. Diagnostic imaging modalities of the eye are now performed and acquired digitally. This change from film has necessitated a new understanding of the principles associated with the digital workflow in ophthalmology and how it affects the diagnostic and treatment protocols of the patient. The course will provide a comprehensive understanding of digital imaging principles and how they apply to ophthalmic imaging. Upon completion, the student should be able to describe the digital capture process, name and correct artifacts associated with digital imaging and explain the various digital image formats and their use in the diagnostic workflow. This program is designed to provide a comprehensive review of the principles of fundus imaging. Basic skills such as patient positioning, camera positioning, focus, saturation and composition will be discussed using case studies. Applications for different magnifications will be discussed. Tips for troubleshooting common artifacts and challenges will be reviewed. Concepts of stereo imaging will be demonstrated using case studies. Upon completion of this course the student should have an increased understanding of terms such as working distance, critical focus, saturation and other critical components to create a good fundus image. The student should be able to recognize a well composed, well focused image and explain the steps taken to create that image. The student should be able to name the common elements of the fundus camera. This presentation will provide an overview of key elements of patient management during ophthalmic imaging such as fundus photography, angiography and OCT and an orderly overview of the common ophthalmic pharmaceuticals involved in ophthalmic imaging.. Tips and techniques to accommodate the physical and emotional needs of the patient as well as techniques to improve scanning in difficult situations.Patient management is often photographer management as well. Methods to provide a safe, supportive and effective venue for all forms of ophthalmic imaging will be discussed. Routes of administration, types of agents and the administration of specific ophthalmic pharmaceuticals will be discussed. Upon completion of this course the student should be able to describe the proper technique for installation of topical ophthalmic drops used in dilation and mydriasis. The student should be able to differentiate between miotic and mydriatic drops and their applications in ophthalmic imaging. Upon completion of this course the student should have three solid tools to accommodate patients with physical challenges, poor fixation, language barriers and other common challenges encountered in the average clinical day. The student should be able to list CDC guidelines for protection of both patient and operator as well as common pathogens that might be encountered and have an increased understanding of the potential adverse use of ophthalmic drops in the photographic venue. Principles of SD-OCT will be discussed in length. A brief overview of instrumentation will be provided. Case studies will be used to illustrate basic principles of OCT imaging and their various applications. Types of reports will be discussed. Common artifacts will be reviewed. Upon completion of this course the student should be able to describe the fundamental principles of SD-OCT. The student should be able to recognize and name the basic layers of the retina as seen by OCT. The student should be able to list three common OCT artifacts. This presentation will provide a comprehensive overview of the principles of sodium fluorescein angiography and Indocyanine Green (ICG) angiography. Concepts such as transit, mid and late phases, hypo and hyper fluorescence and a “how to” game plan for specific disease entities will be covered in length. Upon completion of this program students should have a better understanding of the common terms used in angiography. Students should be able to recognize and explain terms such as pooling, staining, hypo and hyper fluorescence. Students will be expected to have a better understanding of the role of angiography in the hemodynamic study of retinal diseases and disorders. This presentation will utilize case studies of common diseases and disorders to illustrate standardized nomenclature used in ophthalmic imaging. Terms such as hypofluoresence, hyperfluoresence, retrograde filling, pooling, staining will be reviewed using case studies. Terms common to both descriptive FA and descriptive OCT interpretation will be reviewed. Use of methodical descriptions to assist the physician at arriving at a diagnosis will be discussed. Upon completion of this course the student should be able to name four common terms used in describing a typical angiogram. The student should be able to recognize common patterns in OCT used in descriptive interpretation. The student should have an improved understanding of the correlation of FA findings with those of OCT. Despite the growing use of computers in ophthalmic diagnostic imaging, ophthalmic professionals have found it difficult to obtain a comprehensive understanding of diagnostic image data management. This course is designed to provide the essential information for the ophthalmic imager to manage diagnostic images from the point of capturing the image to integrating the data in image management and electronic medical record systems while making it available at the point of patient care. Upon completion of this course, students will have an understanding of image managements systems, electronic medical records and Picture Archive Communications Systems (PACS). The student should be able to explain the hardware and software systems used to connect and move diagnostic images and trouble shoot basic problems encountered in maintaining this digital workflow.